Scott Quigg can pinpoint the exact moment he knew he would make it as a boxer. The Bury-born super bantamweight was on a family holiday in Florida when he was 16 but wasn’t interested in thrill-seeking at Disneyland. Instead he sought out a gym to ensure he didn’t fall behind with his training. 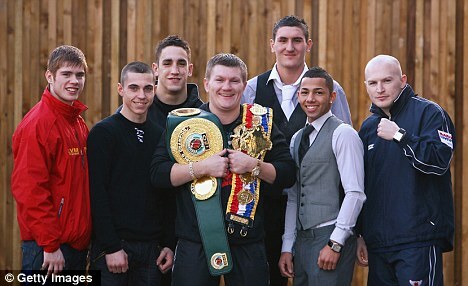 'Everyone was in the pool enjoying themselves and I was going for a run then coming back to shadow box,’ Quigg recalls. ‘I was practising in the games room when my mum came in and asked what I was doing! I wasn’t interested in playing in the pool or anything like that, I was trying to look for a gym in Tampa. Just a year earlier, Quigg had knocked on the door of his headteacher at Elton High School and asked to be expelled in order to focus on fighting. ‘My teachers asked what I’d do without an education, and what I’d do if boxing didn’t work out, because I had nothing to fall back on,’ he told Sportsmail. ‘But I was so focused on becoming a boxer and fulfilling my dreams, I was determined to leave and in the end I proved them wrong. ‘They accepted that it was what I wanted to do and that I felt so strongly about it. I wasn’t a horrible student, I just didn’t like going to lessons. They knew my mind wasn’t going to be changed, and I thank them for letting me leave. Quigg, now 23, took up the Thai version of the sport aged nine before switching to boxing but he had also attempted to forge a career in football. ‘I was at Bury’s school of excellence,’ he confirms. ‘I had trials for Barnsley, Burnley and Manchester City but I was small so I was knocked back. After I was rejected by Burnley, I gave it up. I’d trained as hard as I could and I wasn’t going to grow any faster and so I focused on martial arts. Despite leaving school, Quigg wasn’t allowed to get away scot-free with hard graft. His dad forced him to sweep the floor of the factory he worked in. ‘He showed me what I would be doing if I didn’t make it as a boxer, as I’d left school without an education,’ he adds. ‘It gave me even more drive and made sure I kept my feet on the ground. Quigg had only 12 amateur fights but still managed to win an ABA Junior championship and represent England before turning professional, joining Ricky Hatton’s fledgling stable in 2009. Now trained by Joe Gallagher, Quigg won the British title last year when Jason Booth was pulled out by his corner after seven gruelling rounds. He makes his first defence against Jamie Arthur in Bolton on Saturday. ‘I expect a very tough fight, Jamie Arthur is a quality fighter,’ Quigg adds. ‘He fought for the British title at a higher weight featherweight, he’s fought Booth and Martin Lindsay so he knows what it’s like to be in these types of fights. ‘He’s a good technical boxer but he can mix it up which can be one of his downfalls when he comes in and gets into a fight. Beyond Saturday night, talk will continue over a dust-up with Commonwealth champion Carl Frampton who defended his title last weekend at York Hall. But for Quigg, that fight can wait. So too, can another family holiday in Florida.